Larry Page IO keynote: Google CEO blasts Microsoft, Oracle, laws, and the media. 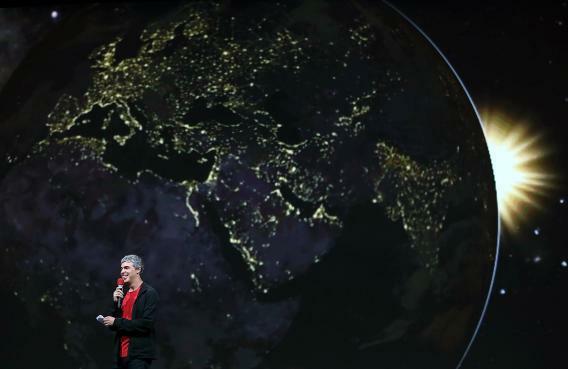 Larry Page wants to save the world, but things keep getting in the way. In a surprise appearance at Google’s I/O conference today, CEO Larry Page took the stage to philosophize and take questions about the company’s products, their role in the world, and how Google can solve world hunger. Along the way, he blew off some steam about politics, the media, and all those other pesky tech companies that keep treating Google as a rival instead of welcoming it as an overlord a collaborative partner. He was referring to Microsoft’s announcement that it would incorporate Google Talk into Outlook.com, even though it doesn’t allow Google to incorporate Outlook functions into Gmail. But as AllThingsD’s Mike Isaac noted, he left out the part where Google recently sent Microsoft a cease-and-desist letter demanding that it remove the YouTube app from its Windows Phones. To recap, Page criticized Microsoft for treating Google as a rival, blasted Oracle for caring too much about money, and then whined about everyone being so negative. Heck, if it weren’t for those other companies standing in the way, Google would have probably already solved world hunger. Well, except for all the laws and bureaucrats and journalists who are also standing in the way. Fortunately, Page has an idea. What if Google could just build its own country with its own rules and do whatever it thought best for everyone? “Maybe we can set aside part of the world,” he mused. “I like going to Burning Man. As a technologist maybe we need some safe places where we can try things and not have to deploy to the entire world.” (As The Verge noted in its live blog, “Larry wants a beta-test country, guys.”) He later lamented that people are reluctant to disclose their medical problems and speculated that the insurance industry was to blame. “We should change it so they have to insure people,” he said. “Maybe we have a safe place where people can go live in a world like that and see if it works.” Other tech companies could presumably come too, as long as they agreed to give Google free access to all their products and data and not to worry about making money themselves. Help Larry out here, readers: What should he call his new country? Googletopia? Glassachusetts? Canada?